Despite the repetition of Paris as a subject matter in Blanchard’s oeuvre, each painting has its own character. As a Neo-Impressionist, Blanchard’s preoccupation was not the scene itself, but the effect of light. For example, in this picture of the Place de la Madeleine, the cobbled street glistens with freshly fallen rain, and the sky above is a mixture of grey and blue as the storm clears. The orange light from the tram in the centre of the road, and the shop windows at the sides provide a romantic and autumnal glow to the painting, reflecting Blanchard’s nostalgia for the past he never experienced. Antoine Blanchard is the pseudonym under which the French painter Marcel Masson painted his immensely popular Parisian street scenes. He was born in a small village near the banks of the Loire. Blanchard received his initial artistic training at the Beaux-Arts in Rennes, Brittany. He then moved to Paris in 1932 where he joined the Ecole des Beaux-Arts there. During his studies he won the Prix de Rome. 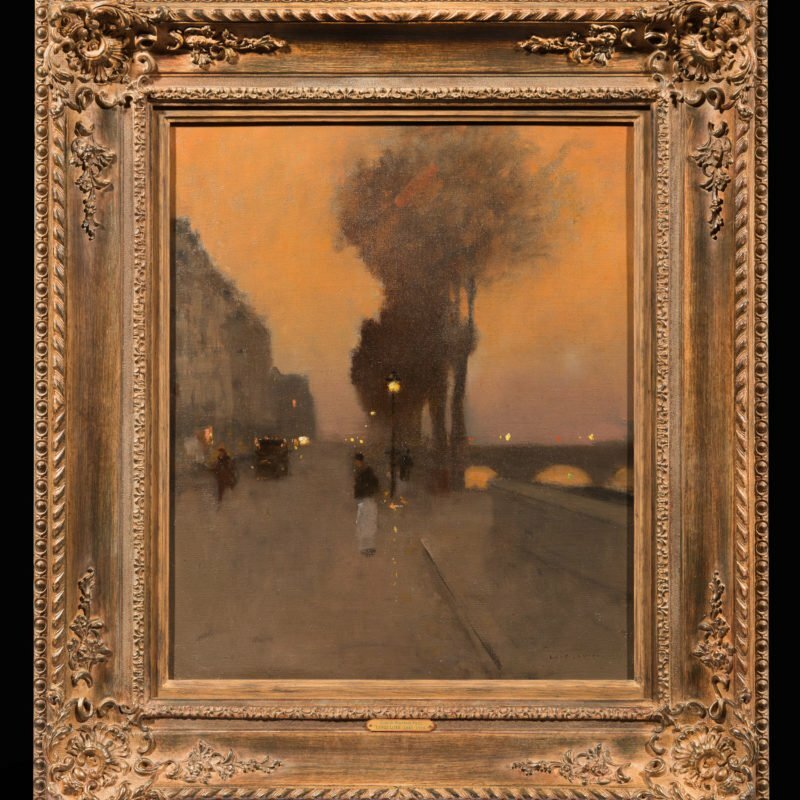 Like his predecessors, Édouard Cortès (1882–1969) and Eugène Galien-Laloue (1854–1941), Antoine Blanchard painted nostalgic scenes of Fin-de-Siècle Paris and the Parisians of bygone days, often from vintage postcards. The artist began painting his Paris street scenes in the late 1950s, and like Cortès, often painted the same Paris landmark many times, in different weather conditions or various seasons. The most recurrent subject matter comprised street scenes on rainy days, often at dusk, showing famous areas of central Paris, busy with pedestrians rushing home and bright storefronts reflecting on wet streets. Rue de la Madeleine was one of Blanchard’s best loved locations, and he painted it to an almost obsessively prolific degree.